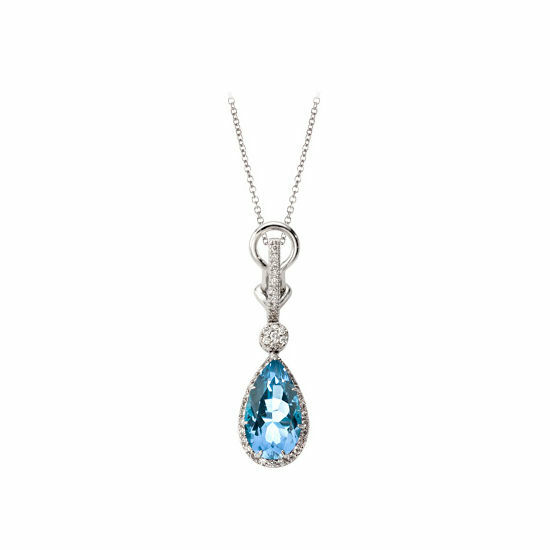 Our Hollywood Teardrop Pendant Necklace features an exquisite 1.6 carat pendeloque cut Blue Topaz stone measuring 15mm x 11mm set with a surround of 48 .35 carat 1mm Diamonds set in 18ct White Gold. The 31mm Blue Topaz & Diamond pendant is suspended from an 18" 18ct. White Gold link chain. The elegant shimmer of this stunning Blue Topaz & Diamond Pendant Necklace will add a touch of Hollywood glamour to any cocktail dress and match perfectly with our Hollywood Teardrop Earrings and Ring. $107.25 will be added to your total purchase price at checkout. This will subsidise tax, duty, credit card fees, insurance in transit and handling.